Helpern Architects has completed what Yale University Librarian Susan Gibbons has called the “spectacular renovation” of Sterling Memorial Library’s cathedral-like entry, called the Nave. Helpern’s team – skilled in preservation, building technology, and interior design – undertook the restoration and modernization project in October of 2011, and the Nave was rededicated September 5, 2014. 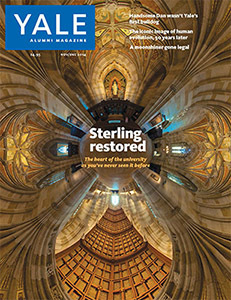 How the Nave was recaptured and redefined is the cover story of the November Yale Alumni Magazine. Cleaned of eight decades of grime, the Nave is now a model of 21st-century library services, with all the technology that was not available to James Gamble Rogers, the original architect. A profile of the project is here. This is the first total renovation in 83 years. When Rogers, a Yale graduate, completed the entire library building in 1931, he used the Collegiate Gothic style, the university’s signature architecture. Sterling was the centerpiece for the campus. The Nave, actually an independent 13,000sf, 75-ft-high structure attached at various points to the main building, is the sole point of entry for students, faculty, researchers, guests at major events, and all those tourists. Over 250 people work there. There is a 150-ft-long, 45-ft-high nave, or central space; a two-story-tall mural of Alma Mater at the western end [also restored]; north and south aisles behind eight massive columns; a transept called “the Crossing”; a sacristy; an exquisite array of 22 stained glass windows, most of them 25’ high, by G. Owen Bonawit; and ornamental metalwork by Samuel Yellin, another noted artisan of the 1930s. The Helpern firm is known for the design and renovation of institutional buildings; this is its sixth project for Yale University. Earlier projects were The International Center for Finance [originally the Skinner-Trowbridge House] and the Yale Center for the Study of Globalization [originally the Davies Mansion, now called Betts House]. Restoring, cleaning, re-lighting. The work entailed cleaning and repairing the limestone and sandstone columns and the stone floor; the intricate vaults and friezes; the painted and gilded oak-and-plaster ceilings; all the metalwork; and the stained glass and skylights. Lighting fixtures have all been restored and retooled; new up-lighting reveals a remarkable, elaborately ribbed and coffered painted ceiling with gilded bosses and details. Changes to the interiors. Although the structure is unchanged, the Nave received new interiors in keeping with the “old/new” mandate, Mr. Helpern relates. The design removed the protruding card catalogues in the south aisle, but those flush to the wall remain as decoration. New cabinets, using the catalogues’ end pieces, disguise and muffle air-handling equipment compressors. Leather armchairs and leather-topped reference tables lined with computers now occupy the space where the card catalogues once stood. The original librarians’ service desks have been moved to the north aisle, while the “chancel” has been set up for tasks such as scanning and electronic self-checkout. There is also a new oval security desk loaded with advanced security equipment. Team behind the restoration. Key people from Helpern Architects were, with David Helpern as Principal-in-Charge: Margaret O’Donoghue Castillo, AIA, as design principal, and Senior Associate Don Lasker, AIA, as the project manager. Karlo Rosete served as project architect and Ilpoom Jeon, technical architect. The Helpern team included the Connecticut office of AKF Group for the mechanical, electrical, plumbing, fire protection, IT, security, and controls engineering. Robert Silman Associates served as structural engineers. Kugler Ning Lighting Design, Jablonski Building Conservation, Jaffe Holden [acoustics and A/V], and Two Twelve Associates [wayfinding] are the prime specialty consultants. The Yale University Office of Facilities, Planning, and Construction served as the client representative, with Mark Francis as Project Manager. Turner Construction Company’s Connecticut branch was the construction manager.